The New England Saltwater Fishing Show being held February 27 - March 1 at the RI Convention Center will have over sixty seminars and over 225 booth. Five Rhode Island State Representatives (Filippi, Reilly, Craven, Shekarchi and Price) have submitted a bill to repeal the “Recreational Saltwater Fishing License” that has been in effect since 2010. The Rhode Island Saltwater Angles Association said they are opposed to repealing the license law. In a draft DEM report that will come before the Rhode Island Marine Fisheries Council next month highlights of funds raised by the fishing license law are noted below with some reasons why the law was instituted in the first place. · The license bill was originally developed with support from the fishing community (including RISAA), environmental and conservations groups, DEM and the General Assembly… it was an inclusive process. · The License Bill enabled RI anglers to register with the State rather than the federally mandated registry which costs nearly four times as much ($25 rather than $7 for State a license). · Over the past two fiscal years the bill has or will turn $478,397 in license funds into nearly $2-million with Fish & Wildlife Service three to one matching funds. · Funds raised are in a restricted account. What is raised by license fees is spent on fishing and access to fishing. If these funds are eliminated, RI will lose out on Federal matching funds. Projects in FY 2014 included: an upgrade to the Galilee boat ramp; funds to start an artificial reef project in Narragansett and Mt. Hope Bays; production of the Rhode Island Recreational Saltwater Fishing Guide; support to the boating/fishing access site maintenance program; support for finfish surveys for stock assessments; management of the Marine Recreational Fisheries Program; and purchase of additional MRIP intercept interviews. Projects proposed for FY 2015 include: boating/fishing access projects such as the Godard State Park boat ramp; fish stock assessment support; support for the artificial reef; and enhanced MRIP data collection. The license law provides funding for important data collection projects that will provide better recreational catch and effort data that leads to more informed recreational fishing decisions on minimum sizes, bag limits and fishing seasons. Accurate data will lead to greater reliability and fishery management strategies that foster greater fish abundance and liberalized regulations when appropriate. The State Representatives submitting the bill believe recreational fishermen in Rhode Island do not want a license law and claim it impedes a fisherman’s right to fish. In checking reports from when the license bill was passed in 2010, advocates for the law believed that the days of unrestricted fishing were over and that individuals did not have the right to over fish to the point of fish species extinction and the determent of the common good. At press time the House Bill (#5352) to repeal the saltwater license law was scheduled for a hearing Thursday, February 26, 2015 before the Rhode Island House Environment and Natural Resource committee. Anglers are urged to relate their thoughts on the Bill to committee members, Bill sponsors, and their local State Representative. Last Monday’s Department of Environmental Management’s (DEM) recreational regulation workshop and public hearing meetings combined what normally takes place over four different evenings into one night. Traditionally participation at specie Advisory Panel meetings held over four different evenings is limited (three to six fishermen, fifteen or twenty if an important issue was being discussed). At the workshop last week 80 anglers listened to stock status and 2014 fishing activity on a variety of recreational fishing species and then asked fish managers and marine biologist questions. Fishermen expressed their point of view and support (or non support) for proposed regulation options and some proposed alternative options. What regulations look like for 2015? 2015 fishing regulations are still up in the air, but here is a current status report. Striped bass will likely be one fish/day at 28” minimum size for private anglers… charter boat catch limits are still up in the air. The first option proposed is one fish at 28” for all anglers; the second option on the table is one at 28” for private anglers and a two fish at 32” option for charter boats. There has been so much discussion and split thinking about the charter boat catch limit for striped bass that the Rhode Island Saltwater Anglers Association (RISAA) decided to pole its members with a survey, and have petitions available for the general public at its New England Saltwater Fishing Show this weekend. The Association will use survey and petition results to formulate its final position. Summer flounder (fluke) quotas were overfished in RI last year. Most at the meetings last week supported the status quo option of an 18” minimum size at eight fish/angler/day with the same season length. Speculation is that RI will make summer flounder regulations a bit more conservative this year to fend off criticism from other states about our over fishing last year. Perhaps the bag limit will be reduced a bit, and/or even an increased minimum size to 18 ½”. Tautog support fell to status quo (the same as last year), 16” minimum size with split seasons… three fish in the spring and late summer seasons with a six fish bag limit in the fall (with a ten fish boat limit which does not apply to charter boats). However, a new stock assessment has been approved for use but will not likely engage for use until 2016, we may have the same regulations in 2015 as last year but 2016 is likely to bring more conservative regulations. Black sea bass landings in Rhode Island must be reduced by a third this year. The solution that received the most support was one that started the season in June (as early as possible) with one fish and then increased the number of fish to five to seven in the fall. Both 13” and 14” fish are being considered to reduce landings. On Saturday and Sunday Capt. Dave Carraro with mate Sandro Maniaci of the F/V TUNA.COM (top captain/boat on the TV show Wicked Tuna) will be at the show. All women and children under 12 will be admitted free on Sunday, March 1st. A scavenger hunt for children will be held Sunday. As a child enters the show with a parent they are given a Scavenger Hunt search sheet that can net them a variety of prizes. Seminar topics include inshore and offshore fishing, specie specific seminars on tautog, fluke, striped bass, tuna, bonito as well as tactics for jigging, chucking, chumming, skishing (extreme surfcasting) and more. Tickets for the show are $10 at the door. A special $1 discount coupon is available online. Visit www.nesaltwatershow.com for additional information and a complete list of seminars, workshops and speakers. Mike Bucko of Bucko Bait & Tackle makes his point at Monday’s fisheries meeting. If one of the objectives of the Department of Environmental Management’s (DEM) new “Lean Initiative” meeting format is to encourage participation at fisheries meetings, Monday night’s meeting at the URI Bay Campus was a big success. Over 80 fishermen openly and freely expressed their points of view on primarily recreational fishing quotas, proposed regulation options and user group proposals. I say user groups because in fisheries management a variety of groups compete for access to the same finite resource (see striped bass example below). Monday’s meeting combined what normally takes place over four different evenings into one night. Multiple meetings have hampered angler attendance in the past. Traditionally participation at Advisory Panel meetings held over four different evenings are limited (three to six fishermen, fifteen or twenty if an important issue is being discussed). Often times those that participate are industry leaders that can sway votes on important issues without getting perspectives from average fishermen because they are simply not in the room. There was no doubt at the 4:30 p.m. workshop that different user groups including private anglers were in the room to listen to stock status, last year’s fish landings and proposed regulation options for summer flounder, black sea bass, tautog, scup, striped bass and others. Anglers were able to ask fish managers and marine biologist questions, express their point of view and support or not support proposed regulation options as well as propose alternative options. The workshop was followed by an official public hearing at 7:00 p.m. Fishermen comments were recorded to pass along to the Rhode Island Marine Fisheries Council (RIMFC) for their March 2 meeting and then will be passed along to DEM Director Janet Coit along with Council recommendations as part of the input she will receive for her decision making process. Fishermen in the room did not agree on regulation options, however, the points of view of many were heard together in a public setting in a much more robust way than traditional Advisory Panel meetings. If you missed the meeting, it is not too late to comment as DEM has extended the public comment period. Written comments concerning the proposed regulations may be submitted to Peter Duhamel, Division of Fish and Wildlife Marine Fisheries office, 3 Fort Wetherill Road, Jamestown, RI 02835 no later than 12:00 Noon on February 26, 2015. Email all communications to peter.duhamel@dem.ri.gov . 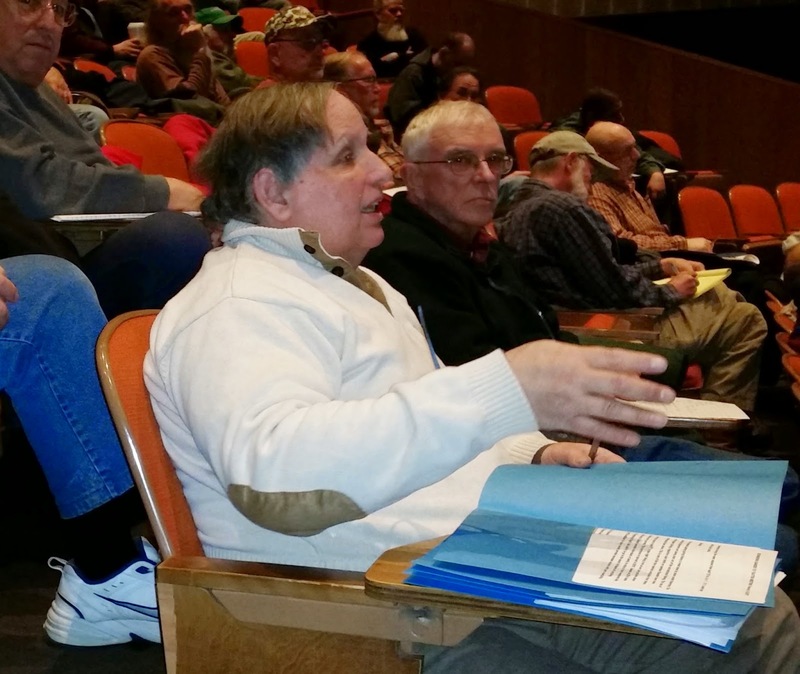 Striped bass took center stage with nearly an hour and half of discussion at the meetings. Coastwide the Atlantic States Marine Fisheries Commission (ASMFC), which sets regulations for east coast migratory species, approved a one fish at 28” for all anglers with the caveat that states could come up with conservation equivalency options that achieved at least a 25% reduction in striped bass landings in 2015. Striped bass fish stocks, particularly the spawning stock of egg bearing females is on the decline and all agree that something has to be done to reduce landings. Conservation equivalency was the sticking point at the meeting; many anglers did not know or did not feel that a two fish solution was appropriate even if it reduced landings by 25%. Every user group has their perspective on fishing quotas and regulations, particularly striped bass. Two options were proposed in the presentation Monday… one fish at a minimum size of 28” for all anglers, and then a second option that was one fish at 28” for private anglers and two fish at a minimum size of 32” for charter and party boats. Some for hire party and charter boat operators at the meeting claimed they earn their living by taking people fishing so they advocated for two fish at 32” for their customers. Many claim their customers fish once a year compared to private anglers and the impact on the fishery is minimal. They also say charter boats contribute greatly to tourism and the economy and should be treated differently from private fishermen because it is a business not recreation. Peter Jenkins of the Saltwater Edge, Newport said he was representing a group of ten bait and tackle shops and that he (and they) supported, “One fish at a 28” minimum size for both private recreational anglers and charter boats.” Many bait and tackle customers practice catch and release, yet many also fish in tournaments and take larger, and larger, egg bearing fish. Commercial fishermen at the meeting wanted one fish at 28” and did not want their commercial counterparts, the party and charter boats, to have the right to take two fish. Michael Lanni said, “If commercial boats are taking a 25% reduction and private angles are bound to one fish at 28”, the charter and party boats should be limited to one fish too.” Lanni continued to say he was not pleased with the new “Lean” meeting format because he did not get a chance to meet with others on the panel to decide how they felt about proposed options. Steve Medeiros, president of the Rhode Saltwater Anglers Association said, “It was our understanding that the ASMFC has already approved a two fish at 32” conservation equivalency proposal for RI.” Representatives on the commission from RI supported that proposal. The feeling was that proposal was going to be approved anyway. “So RISAA submitted a proposal option that included a two fish conservation equivalency option with the stipulation that the reduction be 31% (the same level of harvest reduction that private anglers would be bound to with one at 28”) and include the elimination of the captain and mate fish.” said Medeiros. Historically captains and mates have been allowed to take two fish on each trip. “Adding the mate and captain’s fish to the proposal would at least save four egg bearing fish each trip.” said Medeiros. This proposal would have a great impact on the fish. Now a charter boat with six passengers, a mate and captain can take sixteen fish (this would still be the case with the RIPCBA proposal). However, Captain Donilon’s proposal would have that same vessel taking a maximum of nine fish, just one more than a private boat of eight fishermen and the fish are 32” rather than 28”. So in terms of conservation it could surpass the reduction value of the coastwide solution of one at 28”. Even though RI overfished its quota of summer flounder, most at the meeting supported the status quo option of an 18” minimum size at eight fish/angler/day with the same season length. Tautog support fell to status quo (the same as last year), 16” minimum size with split seasons… three fish in the spring and late summer seasons with a six fish bag limit in the fall (with a ten fish boat limit which does not apply to charter boats). Rhode Island needs to reduce its black sea bass landings by one third. The solution that received the most support was one that started the season as early in June as possible with one or two fish and then increased the number of fish to five or seven in the fall. Both 13” and 14” fish should be considered. More to come on these regulation options as they are reviewed and voted on by the RIMFC on March 2. Fishing Show. The New England Saltwater Fishing Show, being held February 27th –March 1st at the RI Convention Center will have over sixty seminars and workshops. A new House Bill in Rhode Island would increase boat mooring fees for residents by adding on a State mooring fee ranging from $150 to $500 on top of city and town mooring fees. This would double the cost of most mooring fees for boaters (some boaters may have their fees triple in cost). “Revenue from a State mooring fee would go to the Department of Environmental Management (DEM) to provide additional services to boaters.” said Representative Joseph Trillo (R-Warwick) cosponsor of House bill No. 5257. Representative Trillo and Representative Scott Slater (R-Providence) sponsored the bill (dated January 29, 2015) because one of Representative Slater’s constituents was having difficulty getting a mooring said Trillo. “We want consistent mooring rules and regulations in RI. Now some cities and towns allow you to pass your mooring on to someone else, in Newport some people are even putting them in their wills. And, this is not right.” said Trillo. Fees generated from moorings are substantial for cities and towns helping to defray the cost of harbor master programs and harbor maintenance for docks, seawalls, etc. Newport is expected to collect $409,000 and Portsmouth about $65,000 in mooring fees this fiscal year. The proposed legislation increases fees substantially. The written bill is not clear but Representative Trillo said fees would be $150 for vessels with moorings less than 500 pounds, $250 for vessels with moorings between 500 and 1,000 pounds and $500 for vessels with moorings more than 1,000 pounds. Towns calculate mooring fees differently; however, they are substantially lower than the fees proposed by Representatives Trillo and Slater. Fees in East Greenwich are $150 for residents and $300 for non-residents for all sized vessels; South Kingstown fees are $8/foot for residents (or $144 for an 18’ boat) and for non residents $12/foot (or $216 for an 18 foot boat); and the Bristol is $80 for residents and $210 for non residents. It is clear Rhode Island boaters and fishermen alike are keeping a close eye on this bill as many see it as a restriction to access to the water and fishing with such high mooring fees that would double and triple depending on the size of your boat and town regulations. The New England Saltwater Fishing Show is scheduled to take place Friday, February 27th to Sunday March 1st. 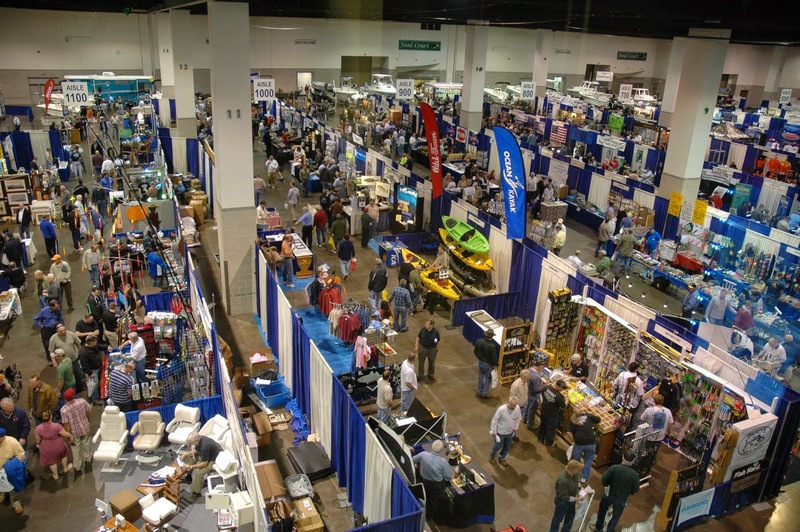 Steve Medeiros, president of the Rhode Island Saltwater Anglers Association (RISAA), said, “Our aim this year is to continue to raise the quality of our seminars, demonstrations and workshops with over sixty (60) of them this year.” The New England Saltwater Fishing Show is being held at the RI Convention Center and will have over 225 exhibitors including tackle, rods, reels, lures, electronics, charter guides, boats, motors, accessories, clothing and much more. This year Capt. Dave Carraro with mate Sandro Maniaci of the F/V TUNA.COM (top captain/boat on the TV show Wicked Tuna) will be at the show. Seminar topics include inshore and offshore fishing, specie specific seminars on tautog, fluke, striped bass, tuna, bonito as well as tactics for jigging, chucking, chumming, skishing (extreme surfcasting) and more. Visit www.nesaltwatershow.com for a complete list of seminars, workshops and speakers. The Atlantic States Marine Fisheries Commission’s (ASMFC) Tautog Management Board approved the 2015 Benchmark Stock Assessment and Peer Review Report for management use. The 2015 assessment evaluated stock status regionally to reflect differences in life history characteristics and harvest patterns. The assessment is the most comprehensive evaluation of stocks to date and provides multiple alternatives for how tautog can be managed regionally. After reviewing the results of the stock assessment and peer review report, the Tautog Management Board accepted the 2015 benchmark stock assessment for management use. However, it expressed concern with the preferred stock structure that would split Long Island Sound harvest between two regions. In the absence of conclusive biological evidence to define the regional boundaries, the Board will consider the management and assessment implications of regionalization and choose its preferred regions for future management. In addition, the Board tasked the Tautog Technical Committee to develop reference points that provide consistent metrics to determine stock status across regions. Results will be presented to the Board at the Commission’s Spring Meeting in May. A more detailed description of the stock assessment results is available on the Commission’s website at http://www.asmfc.org/uploads/file/54da8a572015TautogAssessmentOverview_Feb2015.pdf. Students enhance navigation, seamanship and boating skills at U.S. Coast Guard Auxiliary classes. The Atlantic States Marine Fisheries Commission (ASMFC) winter meeting being held in Alexandria, Virginia this week will finalize many fishery management plan (FMP) recommendations for a variety of species we fish for in Rhode Island. The ASMFC develops management plans and regulations for summer flounder (fluke), winter flounder, Atlantic menhaden, striped bass, black sea bass, scup and other species that travel up and down the east coast. The ASMFC approved one fish at a 28” minimum size for recreational anglers coastwide at their last meeting in 2014, this represented a 31% reduction in harvest. The 2013 striped bass stock assessment determined that the female spawning stock biomass (SBB) has continued to decline since 2004 and is estimated at 128 million pounds just above the SSB threshold of 127 million pounds, and below the SSB target of 159 million pounds. So something had to be done to curtail harvest. Last year anglers could take two fish at 28”. The ASMFC’s striped bass technical committee related options provided to reduce fish landings by 25% only have a 50% chance of working. They only have a 50% chance working because the technical committee developing options were concerned that if reductions were too severe or too conservative that they would be harmful to the social and economic well being of those harvesting striped bass for a living (quotas for commercial striped bass fishermen have also been reduced by 25%). The ten bait and tackle shops that signed the letter included The Saltwater Edge, Watch Hill Outfitters, Quaker Lane Outfitters, Ocean State Tackle, The Tackle Box, Breachway Bait & Tackle, Block Island Fishworks, Cardinal Bait & Tackle, Pete’s Bait & Tackle, and Quonny Bait & Tackle. Summer flounder (fluke) data shared at a January ASMFC input meeting showed that RI overfished last year and more conservative regulations may be on the way. In 2014 the projected harvest was 126,724 fish and through Wave 5 RI’s share of the regional harvest was 181,601 fish. Atlantic menhaden’s management plan recommendations are also in dispute pitting recreational anglers against the interests of the commercial Atlantic menhaden fishery. A recent 2015 stock assessment indicates the species is not overfished and overfishing is not occurring. Black sea bass is still problematic for the ASMFC. A new stock assessment is not scheduled to be available for use by fish mangers until 2016. Present data indicates that anglers are overfishing quotas yet private and commercial fishermen claim there are an abundance fish in our local waters. Black sea bass abundance has moved north in recent years as the ocean water has warmed. So you might say climate change has impacted this fishery in a positive way for Rhode Island fishermen. With this abundance shift and the importance of the species to both commercial and recreational fishing in Rhode Island fish managers need to take climate change into account when developing plans. Unfortunately, we will have to wait until 2016 for the new stock assessment to play a role in managing black sea bass. For now, in 2015, recreational bag limits, fishing seasons and minimum sizes will likely be more conservative. Visit the ASMFC website for this week’s meeting agenda, supplemental meeting material and news at http://www.asmfc.org/files/Meetings/Winter2015/CombinedSupplementalFiles_Jan2015.pdf. Rhode Island will hold a 4:30 p.m. workshop and 7:00 p.m. public meeting on Monday, February 16 to discuss how ASMFC regulations will impact specie management plans and recreational fishing in Rhode Island. Anglers are urged to attend. Once reviewed by the Rhode Island Marine Fisheries Council and approved by DEM director Janet Coit, these will become saltwater fishing regulations for 2015. Visit www.providencejournal.com/sports for State Park winter fun ideas (ice fishing, skating, cross county skiing and more). Also see information on boating, sailing and navigation skill courses being offered by the U. S. Coast Guard Auxiliary this winter. Ice fishing (and skating) is taking place on some ponds in Northern Rhode Island. Check with recreational departments in cities and towns for safe ice conditions. For lakes and ponds in state parks call the DEM ice information telephone line at 401-667-6222. Cod fishing is still on but party boats have been unable to sail due to bad weather conditions. Captain Dave Monti has been fishing and shell fishing on Narragansett Bay for over 40 years. He holds a captain’s master license and a charter fishing license. Contact or forward fishing news and photos to Capt. Dave at dmontifish@verizon.net or visit his website at www.noflukefishing.com. The Coast Guard Auxiliary is once again offering some outstanding boating courses to help boaters develop and/or sharpen their skills. Local Flotilla’s, which is the basic organizational unit of the Auxiliary, are offering courses in a number of locations. This winter the U.S. Coast Guard Auxiliary North Star Flotilla of Warwick is offering three courses starting this week at Toll Gate High School (building B), 575 Centerville Road, Warwick. With all the snow we have been getting it is important to note that if Warwick Schools are canceled, then the boating classes are CANCELLED. The courses include Boating Skills & Seamanship, Sailing Skills & Seamanship and Navigation (Beginning & Advanced). The Power ($85) and Sail ($105) classes meet twice a week on Monday and Thursday for eight weeks. The navigation class meets Thursdays for 15 weeks and the cost is $160, the first three weeks for beginners is $45 and the rest of the course (advanced navigation) is $115. Courses, originally scheduled to start Monday will now start Thursday, February 5 at 7:00 p.m. It is not too late to register as classes are taught in module style. Students can park in back behind the school by the football field. You can visit the Flotilla’s web site at www.northstarflotilla.com or call Capt. Nick Butziger at 401.739.6028. The Department of Environmental Management (DEM) is encouraging children, families and individuals to get outdoors and enjoy the recreational resources that Rhode Island state parks and management areas have to offer. Cross-country skiing, snowshoeing, sledding, snowmobiling and ice fishing are among the many outdoor activities that residents and visitors can experience at state parks and recreation areas across Rhode Island. DEM's Division of Fish & Wildlife has stocked about 3,000 trout in ponds throughout Rhode Island for the winter fishing season. Locations include Carbuncle Pond, Coventry; Olney Pond, Lincoln; Barber Pond, South Kingstown; Silver Spring Lake, North Kingstown; Upper Melville Pond, Portsmouth; Meadowbrook Pond, Richmond; and Round Top Ponds, Burrillville. Fish & Wildlife staff routinely clears the parking lots at many fishing and hunting access areas in the winter, including the upper and lower lots at Browning Mill Pond in Arcadia Management Area, Tefft Hill, Frosty Hollow Road, and Breakheart Pond. DEM reminds fishers that ice on the ponds must have a uniform thickness of at least six inches before it is considered safe. At press time, the ice at monitored areas at Lincoln Woods State Park in Lincoln, Goddard Memorial State Park in Warwick, and Meshanticut State Park in Cranston is unsuitable for skating at the present time. For the latest information on ice conditions at these three locations, call DEM's 24-hour Ice Information telephone line, 401-667-6222. Residents should contact their local recreation departments regarding skating opportunities and conditions in individual communities. Ice must have a uniform thickness of at least six inches before it is considered safe. DEM has an ice safety guide that can be found online at website, www.riparks.com . The Department is reporting good snow conditions for cross-country skiing at Pulaski Memorial Recreation Area in Glocester. Due to deep snow conditions, the trails have been partially tracked and all routes are open. DEM's Division of Parks and Recreation maintains four one-way loop ski trails at Pulaski, ranging from less than one mile to four miles long. The management area's 10 miles of tracked trails offer beginner and expert cross-country skiers a variety of terrain on which to ski. For example, the half-mile long Pulaski trail has several small inclines and stays close to the start point. The three other trails – Hemlock Glen trail, Covered Bridge trail, and Woods trail – cover longer distances, and each has some downhill terrain. While Pulaski Memorial Recreation Area is the only state facility offering tracked ski trails, Colt, Goddard, and Lincoln Woods State Parks and state management areas, including Arcadia in Exeter and Big River in West Greenwich offer open areas where patrons can enjoy snow-related recreational activities. All users of state management areas are reminded that they must wear 200 square inches of fluorescent orange material -- equivalent to a hat or cap -- during the hunting season which ends on February 28. George Washington Management Area in Glocester provides designated trails for those operating snowmobiles. Snowmobiling is also permitted on the roadways in Arcadia, Burlingame, Wickaboxet and Woody Hill Management Areas, Burlingame State Park and Campground, Lincoln Woods State Park, Snake Den State Park, and on open fields at Colt State Park. All snowmobiles must be registered by DEM's Office of Licensing and Registration, located at 235 Promenade Street in Providence. Regulations regarding snowmobile use in state parks and management areas are available online at http://www.dem.ri.gov/pubs/regs/regs/fishwild/parkmgmt.pdf . 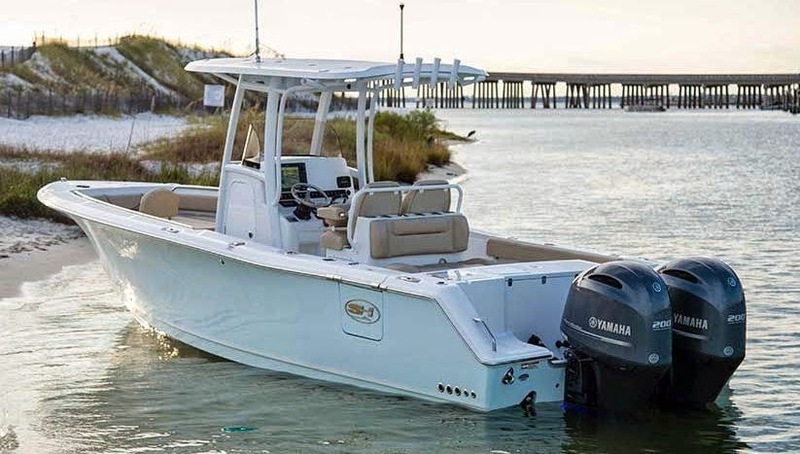 The Sea Hunt Gamefisher 27 with a new side door for boarding passengers or fish. Over 100 manufactures had vessels on display including power boats, sail boats, dinghies, personal watercraft, kayaks and canoes. The show featured an enhanced fishing area with excellent workshops, and a new Washington Trust Pavilion presentation area with local chefs, book authors and world class sailors. I thought the Boat Show was great. Here’s what I liked. I bumped into Shanti Bar inventor Neheet Trivedi, a MIT Sloan Business School graduate that was walking the show testing the interest level in his new motion sickness product. 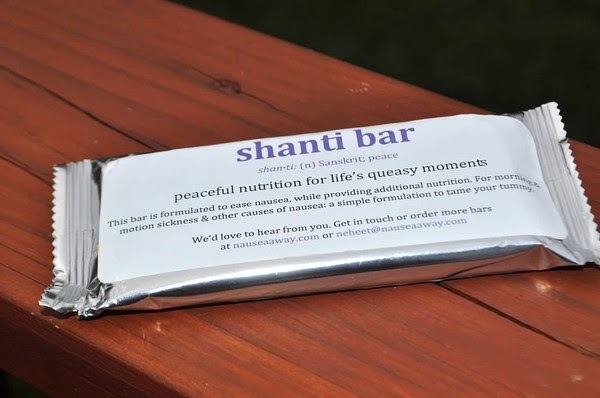 “We first developed the Shanti Bar to reduce nausea during pregnancy and then found that motion sickness at sea was a huge market for us too.” said Trivedi. 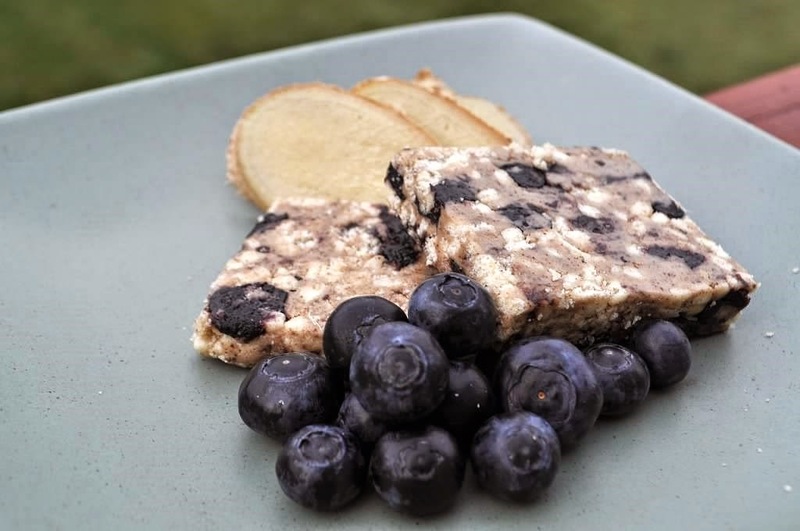 The bar (which tastes like blueberries) was developed out of research that demonstrates the successful role protein, ginger, and vitamins play in reducing nausea. Shanti Bar is sold on vessels owned by Boston Harbor Cruises and can be purchased online at www.theshantibar.com. Debbie Wood (of Wood Boat and Motor, Warwick) shared some of the attributes of the new Evinrude E-TEC G2 and I was impressed. This engine is a monster delivering the power you need with high efficiency and high design. Wood said, “This engine is extremely efficient with no scheduled dealer maintenance for five years or 500 hours and it is backed by a five-year engine and corrosion warranty.” Evinrude says the engine is the first outboard ever designed to perfectly match your boat, inside and out. “Over 400 color combinations are available including color panels for the engine side, top and front panel areas”, said Wood. The engine is available in 200, 225, 250 and 300 horsepower. Zim Sailing, Warren, RI provides one-design sailboats, parts, accessories and services. They had a Hartley Wanderer, a family- friendly 14-foot sailing dingy of display that looked like it would be fun for sailors of any skill level. The boat features interior seating, a dry storage locker and a roller-furling jib. The Wanderer is comfortable yet stable and is made in the UK. However, Zim Sailing has designed and built their own vessels too; including high performance sail boats said Allie Gray, Zim Sailing’s performance sailing associate. “We built the Zim 15 as a performance dingy for those looking for more excitement. The entire boat weighs about 200 pounds completely rigged. It is a racing dingy for two.” The suggested price on the Zim 15 is $11,500 and the Hartley Wanderer is offered at $10,450. Capt. Jack Sprengle of Warwick who produced the boat show fishing seminars said, “We have had as many as 50 people attend some sessions with people standing in the isle. Captains marketing their charter businesses and our guest speakers are doing very well.” I managed to catch the end of Capt. BJ Silvia’s (Flippin Out Charters) presentation on tautog, “A prize tautog (over ten pounds) can come any time… so you have to be ready any day… at high tide, low tide, at the start of the day, or at the end of the day.” said Capt. Silvia. “Inland Marine of Chepachet, RI has been in business for 40 years.” said Ross Lemieux. Ross and his three brothers own and run the business that their father started. They had the Sea Hunt Gamefisher 27 on display at the show and it was spectacular. Its side entry door, recessed trim tabs and hydraulic steering are standard features hard to beat. And they come ready to fish with multiple insulated fish boxes and a live well with cockpit and bow bolsters. Lemieux said, “This vessel is ready to fish but it is great for family cursing too with an enclosed head.” The show special price was $104,000. 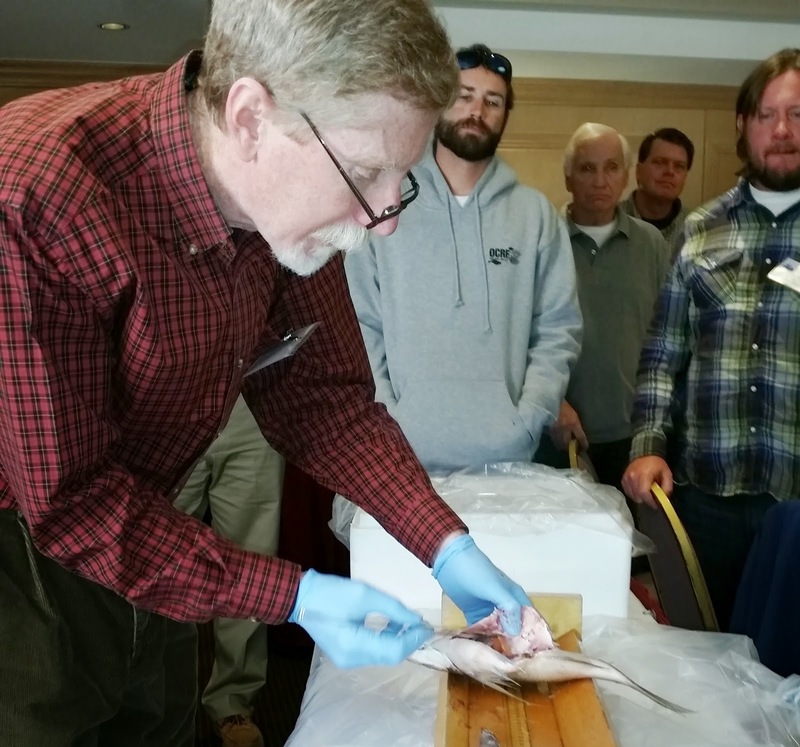 Gary Shepherd, biologist from the Northeast Fisheries Science Center, Woods Hole, MA shows fishermen what scientists look for when dissecting fish during growth and population research. Last week 25 commercial and for-hire recreational fishermen along with industry participants went to school to learn about fish populations, how they grow, what impacts them and how we aim to keep them at maximum sustainable yield (MSY) levels. The Marine Resource Education Program (MREP) workshop, held at the Crowne Plaza Hotel in Warwick, was sponsored by the Gulf of Maine Research Institute, a non-profit research center dedicated to being a catalyst to find solutions to ocean and fisheries challenges. “At this workshop, you are going to find out where all the numbers come from.” said John Williamson, MREP implementation program member. The “numbers” Williamson was referring to are fishing quotas or allowable catch limits (ACLs) for various fish species. 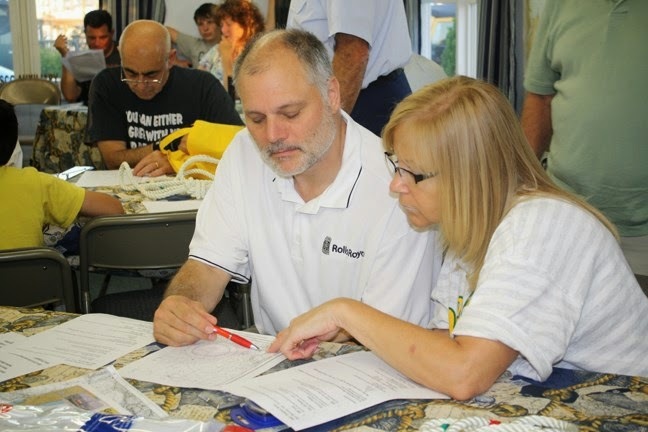 Participants were also schooled on ecological drivers of fish abundance, conservation, sampling survey techniques, stock assessments and the effects of climate change on fish populations along the east coast. Last week’s MREP session focused on science issues as they relate to fisheries, a second workshop scheduled for March will address management issues. The MREP was founded in 2001 to provide fishermen the tools and information needed to foster conservation while creating an understanding of the science and management tools used to regulate fisheries. Additionally, it helps policy and science professionals to become more familiar with the workings of the fishing community. Programs are run in several locations throughout the year. Seven scientists from NOAA labs, university based fisheries programs and from NOAA’s Northeast Fisheries Science Center instructed participants on topics such as ecological drivers of fish abundance, conservation, sampling, statistics and fish surveys, stock assessments and the effects of climate change on fish populations along. Highlights of the session included an explanation of “Maximum Sustainable Yield” and how it aims to take the maximum number of fish out of the water that will allow for continued, good healthy growth of fish species in terms of fish size and numbers of fish. If too many fish are taken out of the water the biomass could decline to dangerously low levels and have difficulty recruiting new fish to desired levels. If too few fish are taken a species may experience slow fish growth or not enough population growth due to crowding, less food supply, decease and the species could experience major decline. Gary Shepherd for the Northeast Fisheries Science Center at Woods Hole, MA led a presentation on fish population biology. Shepherd demonstrated how to tell a fish’s age by examining lines or growth rings on their scales with a microscope and/or by counting growth rings on their otolith which is a small calcareous concentration at top of a fish’s spine (and/or in the inner ear of vertebrates). He then dissected several fish including tautog and scup to relate what biologist normally do in the field checking and recording fish ages and stomach content to gain insight on fish population growth. Another highlight was Dr. Rob Latour of the Virginia Institute of Marine Science, who has accumulated data on the prey of fifty common east coast fish species as well as what they eat. If you are interested in what a fish eats you can register for Dr. Latour’s data base at: http://www.vims.edu/research/departments/fisheries/programs/multispecies_fisheries_research/interaction/fish_food_habits/index.php . Dr. Jonathan Hare, director of NOAA’s Narragansett, RI laboratory related the impact of climate change on a variety of fish species commonly caught on the east coast such as yellowtail flounder, summer flounder, black sea bass and a host of others. Dr. Hare related since 1920 waters on the east coast continental shelf have increase by 1 to 2 degrees centigrade as the abundance of fish populations such as flounder and black sea bass have shifted north. Cold water fish like cod have also left near coastal waters as they have warmed. Fishermen at the workshop testified to seeing a difference in fish abundance in a number of species as well as seeing warmer water species that they do not normally see come into our waters. You can now track 80 northeast species (650 in total) on a new Rutgers University website called OceanAdapt at http://oceanadapt.rutgers.edu . The future looks bright too as we explore new and better ways of doing things. Like eco-system based management models that take into account environmental factors, food supply, climate change, fishing effort/catch and other factors. Programs such as the Marine Resource Education Program provide an important link with education, enhanced communication, and foster a better understand between fishermen, fishing communities, scientist and fish mangers. Besides boats highlights this year include a boating and a fishing seminar tracks. Boating session will focus on boating safety and equipment of all types. A full range of fishing seminars organized by Capt. Jack Sprengle of East Coast Charters will feature a variety of local captains and fishing guides speaking on ten topics from how to land trophy bass, spear fishing strategies, how to troll, land large cod, and how to catch swordfish and sharks. Additional highlights include top chefs from seafood restaurants who will be on hand to demonstrate sea-to-table cuisine. Attendees can also learn about the Volvo Ocean Race and their planned May visit to Newport for the race’s only North American stopover. Visit www.providenceboatshow.com for show information and details. Cod fishing continues to be good. Frank Blount of the Frances Fleet said, “Saturday was a solid day of cod fishing with lots of action at the rail from both short fish and keepers. Top fish on Saturday was ten pounds. The top fish for the week was 20 pounds.” Party boats sailing for cod fish at this time include the Seven B’s at www.sevenbs.com, the Frances Fleet at www.francesfleet.com and the Island Current at www.islandcurrent.com . Guest panelist Roger Tellier of North Kingstown said, “There’s nothing better than a little neck on a half shell fresh out of the water… Where else can you go and in a few hours harvest quahogs, steamers, mussels, oysters and scallops…” Join Roger, Barry Fuller, Paul Kennedy and Capt. Dave Monti as they have a panel discussion on shell fishing recreationally in RI. The RI Saltwater Anglers Association seminar takes place this Monday, January 26, 7:00 p.m. at the West Valley Inn, West Warwick. Non-members welcome, $10 donation to the RISAA Scholarship Fund, members attend free. Visit www.risaa.org for details. A meeting of Rhode Island's commissioners to the Atlantic States Marine Fisheries Commission (ASMFC) will be held on Thursday, January 29, 6:00 p.m. in the Hazard Room in the Coastal Institute Building at the URI Bay Campus in Narragansett. The purpose of the meeting is to review and discuss the agenda for the upcoming February 3-5 ASMFC meeting in Alexandria, VA which will include important striped bass, summer flounder, black sea bass and other spice management plans Rhode Island will have to follow in 2015. Visit http://www.asmfc.org/home/2015-winter-meeting for the meeting agenda. “Nearly 90 percent of the anglers who responded to the our striped bass survey said they caught fewer fish in 2014 than in previous years, and 71 percent said the fish they did catch were smaller,” said Brad Burns, president of Stripers Forever, a conservation organization that advocates game fish status for wild striped bass. “The survey response from 830 anglers, most of whom have fished stripers seriously for more than 10 years, has been increasingly negative since 2006.” said Burns. For survey details visit: https://www.stripersforever.org/2014-annual-angler-survey-results .